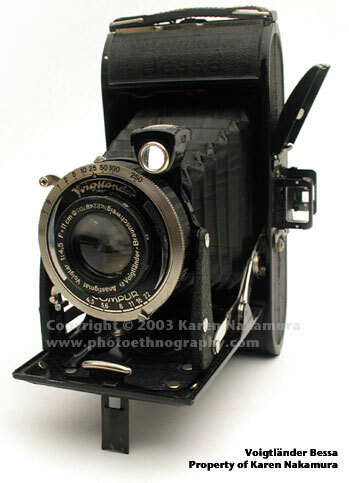 The original Voigtländer Bessa is a classic folding medium format camera. I bought mine at an antique show in Roseville, MN in the summer of 2002. 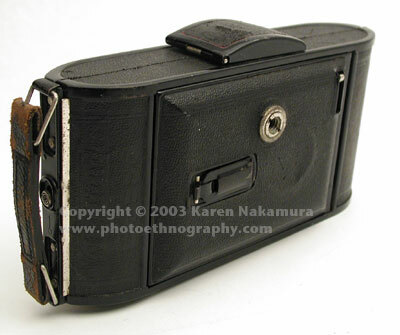 This Bessa I, produced from 1931-49, is scale focusing, which means you guesstimate the distance to your subject. The Bessa RF of 1936/1948 and Bessa II of 1950 had coupled rangefinders, which is nicer but raises the price of the camera several times over on the used market. Using the text or images on this website without permission on an ebay auction or any other site is a violation of federal law. 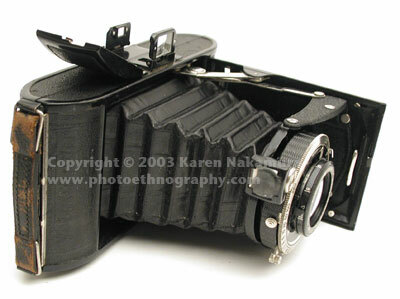 The Bessa came with four lens options, in increasing quality: Voigtar, Vaskar, Skopar, and the Color Skopar. There were also three leaf shutter options, also in increasing quality: Prontor, Compur, Compur Rapid. This camera came with the cheapest Voigtar, but I have to say I like the slightly dreamy, low-contrast image it provides. It's a welcome antidote to the hyper-contrasty, hyper-sharp images produced nowadays. And you can contact print the 6x9 negatives, they are so large. I have the feeling this unit was produced before the war because the lens appears uncoated (although surprisingly in pristine condition). There are actually two ways to frame a photo with the Bessa. You can use the eye-level sports finder (shown popped out on the right) or the waist level finder in portrait or landscape orientations (shown above the lens at the 1 o'clock position). There is no sophisticated winding mechanism on this camera. You simply wind the film until the next backing paper mark appears through the red window on the back of the camera. No double-exposure prevention, of course. One of the things the Voigtländer company was famous was for recycling trademarks. The Bessa name was applied onto a variety of cameras, some of which shared no common lineage. Although Voigtländer bankrupted in the 1970s, the company that took over its name in the late 1990s (Ringfoto) continues the tradition -- of recycling product names. They just licensed the name to Cosina, which has come out with a very nice line of 35mm rangefinders using the Bessa moniker, just be assured that they have zilch to do with the classic, first Voigtländer Bessa folders. Hah! Measure the distance to the subject and use scale focusing. OK!!!! Actualy, I stopped by to see your Voightlander (nice and just like mine, but must confess I have been trying for at least an hour to close mine. Ive pushed, pulled, etc. and , at this point am a little desperate. Please, tell me the secret to closing it. I really havent had a chance to check out your web site. Thank you. I don't have mine handy but with these folders, you either push a button at the base of the lens, near the hinges, or you squeeze the hinges a bit so they “crack” open. But never force it as it’s easy to bend the sheet steel.